As many of you know I am bombarded with requests for product reviews that I refuse. I've been fortunate to have been sponsored by EcoStore during the year. I use their dish liquid exclusively now and I'm more than happy to keep using it and to recommend it. They're wonderful sponsors, they send me laundry liquid and they don't hassle me. I don't push their products but when anyone asks me what I use to wash my dishes, I'm happy to tell them I use EcoStore dish liquid. A few months ago they asked me to try their new fragrance-free line of products. I said I would and asked if they could send three packs so Sarndra and Sunny could test it out on their families too. Both have toddlers and my son Kerry has sensitive skin. It took a while for each of us to use our products because we were all mid-cycle with our other products. I'm not sure what Sarndra and Sunny use but I was using homemade laundry liquid and my four ingredient castile soap - for showering, handwashing and hair washing. I started with the handwash. We always use soap to wash our hands but with Hanno's accident in late August, it was impossible for him to use soap. The hand wash worked very well for him. I'd been unimpressed with hand wash liquids used in the past but I loved the EcoStore one. It really does leave your hands feeling nourished and clean. The laundry liquid cleans as well as my homemade liquid and even removes stains if you rub some directly onto the stain, leave it for a while then add it to the normal wash. Their regular powder works well too but I prefer to use the liquid as you can use it for more types of cleaning. For example, I used it to clean down a door that I noticed had the beginnings of mould growing on it, from the floor up. Sunny was happy with every product and used it all on Jamie who had no adverse affects. Kerry told me he used the body wash and hand wash and thought they were great - no flare ups on his skin. He said he will use it in the future. "We are very happy with the EcoStore products we have been using. It is very important to both my husband and myself that we minimise chemical use in the house, especially those that come in direct contact with our skin and most importantly our son's. The EcoStore Ultra Sensitive range tick all the boxes for us; containing no harmful ingredients, being cruelty free (very important to us also), are kind to our skin and clothes; but perhaps most importantly, do their job. I love the hand wash, it doesnt dry my skin out like other soaps and hand washes do. The body wash is lovely too, with no over powering perfume as other body washes have. 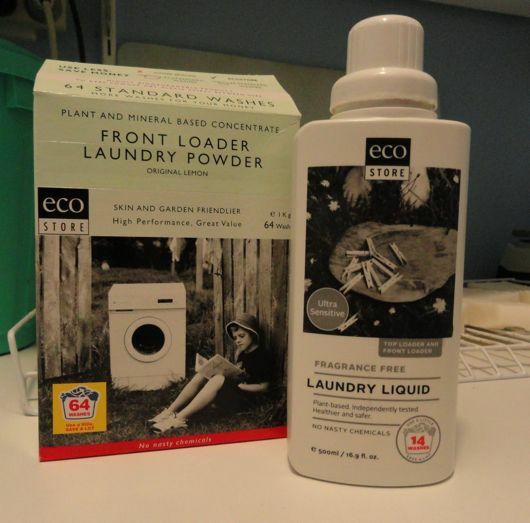 I have also tried the laundry detergent, laundry powder and laundry soaker. All wash our clothes and remove stains well. I am very happy with our laundry results. Another added bonus to the EcoStore range is that it is made by a certified CarbonZero manufacturer, who aim to reduce their greenhouse gas emissions or carbon footprint with the highest level of credibility and integrity. Thank you for these wonderful products that we can feel good about buying and using." As most of you know I don't like fragranced products and these had no hint of any perfume at all, they were mild and gentle on my skin. My favourite product of the lot was the hand wash and I'll use that again, but all of them worked well. When I did my last review of EcoStore products my criticism then was that they were too expensive. I just did a check with the Woolworths online store and all the EcoStore products are now within an affordable range. The shampoo was more expensive than the regular shampoos but was definitely not the most expensive. The 500ml dish liquid is on special at Woolworths now for $2.99. I will continue to make my own soap and laundry products but in those times when I need to buy them, EcoStore will be the product I buy. I've just been looking at their website and noticed they recently won the Home section of the Green Lifestyle Awards. I'm pleased there is a range of products that we can all use, made by a company who don't use any harsh chemicals, and who freely show their ingredients list. I wish every company had a similar policy. I am happy to recommend EcoStore to you. I'm so pleased that you have written this post, Rhonda. I would rather paint than make soap so I look forward to being able to buy something that is good and Eco-friendly. I have been using Ecostore dishwasher powder since you first mentioned the company. I find it good, lasts a while as well! I've been trying different earth friendly brands. I have asthma and tend to seized up in lungs do to chemicals. But one of my complaints the dish washing soap tend to loose it bubbles. I love the Ecostore dish liquid and love it more than anything I've tried before. I might give some of their other products a whirl when I run out of my current supplies. I have to say, I have been using the Ecostore dishwashing liquid since you reviewed it and I think it's really good. It doesn't look as if their products are available yet in Canada, but I'll keep a watch for them, or perhaps might be able to find something comparable. Thanks for the thoughtful review, it gives me a framework to consider when I look at such items. I love ecostore, i started buying thier products a few years back and have never looked back. I like some fragrance and use a thier grapefruit or lemon dishwashing liquid and thier eucalyptus laundry liquid. I've tried thier bodywashes and hand wash as treats and they are just lovely! Definately a good recommendation. Can you buy these products online? I really love their laundry powder - the Lemon Verbena one. It seems a little bit more expensive but I find that a box of it lasts much longer so I consider it value for money. The scent is subtle and quite natural. Once the clothes are dry they just smell clean. What great sponsors for your blog Rhonda! Ecostore is one of my favorites! 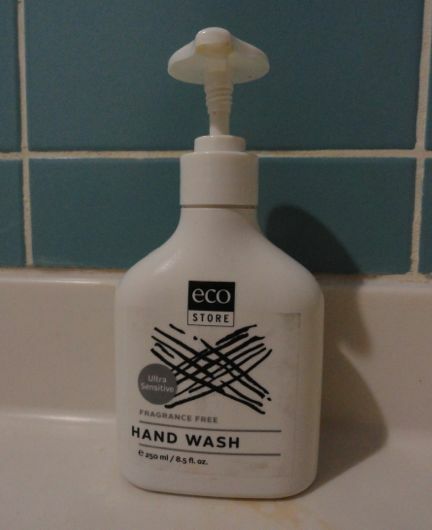 I think their hand wash is the absolute nicest, but I do wish that they would make the pump bottle in a different design, because after a while, it clogs and a lot of it splatters in all directions and gets wasted. I also love their body butter, their dish liquid is the best, and laundry powder and stain remover.